I determined that there was no good tutorial on how the average person can liquefy nitrogen or air. A few references to cryocoolers, which use an internal helium Stirling engine to create a cold head exist, and I even saw one person use this as a means to liquefy nitrogen, allowing the gas to condenses as it passes over the head. This method is cheating because it relies on a self-contained refrigeration unit. I wanted to do this using regenerative cooling just like Carl Linde back in 1895. This tutorial will go over some basic theory about cryogenic liquefication. The tutorial will cover all the steps necessary for one to duplicate my work and build a nitrogen gas liquefier. Each page covers a different topic necessary for the process, including temperature measurements, the compressor, precooler, cooler, throttle and reservoir. Basically, there are three methods for making liquid nitrogen. One, you can use a cryocooler. You need to acquire a cryogenic refrigeration unit and strip out the cold head. Two, you can use a turbo expander. 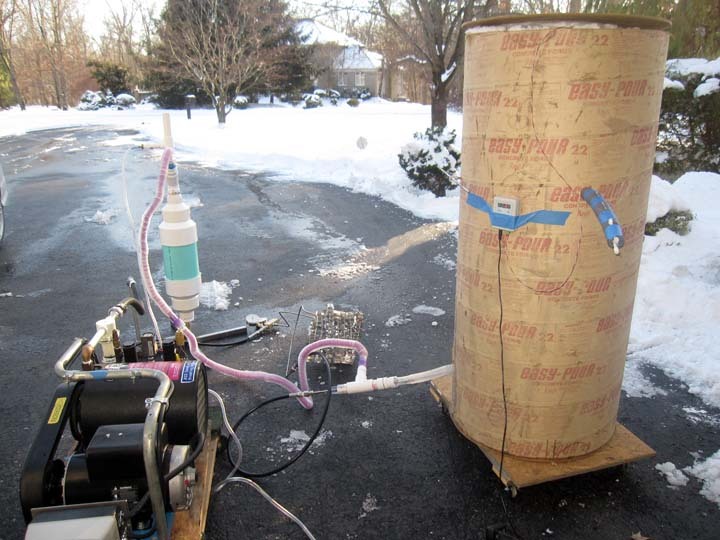 This is a device that takes pressurized gas and extracts work from it during the isentropic expansion phases. This is truly the most efficient method, but the cost is prohibitive for the home builder. Finally, one can throttle the pressurized gas. While it is true that an ideal gas maintains the same temperature when expanded into a vacuum, real gases, due to friction and other losses does drop its temperature. I believe it falls 1/4 degree Centigrade for each atmosphere of pressure drop. This is the method using the Joule-Thomson effect is the one that deserves attention. Now, simple JT expansion would just drop the temperature 50F if we compressed our gas to 200 atmospheres (2900 psi). One needs to cool the gas prior to expansion so the exiting gas from the nozzle is low enough for gas to condense and liquefy. Linde utilized regenerative cooling. The exiting, cool gas passes back over the pressurized coils in a countercurrent fashion. This cools the incoming gas; the expanded gas on the next pass is slightly cooler than before. After many cycles, gas will be cold enough to liquefy and collect in a reservoir. Now, everything I have mentioned is already available in books and on the internet. So, why this tutorial? While the theory is simple, the actual application of the theory and construction of a working device is not as simple. I successfully liquefied air in sufficient quantities and I plan to show you how this can be done for the home builder. The generator gets its supply of N2 from my own homemade pressure swing adsorber. This is a completely separate project that you can view here when you are done with this one. I have built a reliable cryogenic thermometer for a fraction of the cost of other models being sold. It has a range of -400F to 250F in increments of 0.1F. It can measure Fahrenheit and Celcius. The temperature drift is no more than 0.005F/F, giving you a very stable reading. The display is LCD so you can read it in all lighting conditions. It runs off of 120vac using an AC-DC adapter and uses a 6' long RTD probe. All of this is included. Below is an image of the device. I will be selling these soon for about $150, which is well below the cost of other commercial items.. Please check back. If you like the really cold, you may like the really hot. I have an great tutorial on induction heating as well as many videos on Youtube under the handle "imsmooth". Below is one of the links to an early heater.